Our holiday extravaganza continues as Jenn from Rook No. 17 shares today’s delectable idea! 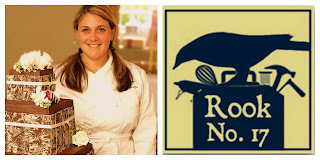 I’m Jenn ~ the crafter, baker and glitter shaker behind the creative nesting place, Rook No. 17 where I share my original recipes, vintage inspired crafts and cake decorating tips and tutorials. I’m delighted to be taking part in decking the halls here at Positively Splendid for the fun, creative, and inspiration filled “A Swell Noel“! There are two things I often find myself short on during the holidays — time and money. Because the holiday season brings with it a flurry of parties, get-togethers, and other festive social events, I find it helpful to have a few tricks up my sleeve for putting together last-minute hostess gifts brimming with joyful tidings and good cheer, but easy on the budget. I’m as happy as a kid on Santa’s knee to share with you my quick, easy and budget-friendly tutorial for making two different types of colored sugars to rim the glasses of holiday cocktails! The best part about this project is that it can be quickly made from items you probably already have in your pantry! Step 1: Select a jar. I like to use the 8oz. Crystal Quilted Jelly Jars from Ball. Measure out sugar by filling jar. Pour sugar in to a Ziploc bag. Step 2: Smear red gel food coloring on the inside of the bag. I use four large drops to make this shade of red. Step 3: Seal bag and alternate between massaging the sugar and shaking the bag to evenly distribute color. This will take approx. 4 minutes. Periodically check the seal on the bag. Step 4: If you’d like, you can pour the colored sugar through a sifter or sieve and in to a bowl to remove any remaining lumps of color. Funnel or pour sugar back in to the jar. Step 5: Screw the lid on the jar. Top with a cupcake liner, round of fabric, or a paper doily and tie off with ribbon. Print label, cut and adhere with a glue stick. Citric Acid is inexpensive and can be purchased in some health food stores, large pharmacies, and online. If you don’t have access to Citric Acid, you can buy a produce preserver like “Fruit Fresh” which is commonly found in the canning section of most grocery stores. When using Citric Acid, you’ll want a 1 to 3 ratio of citric acid to sugar. Because it already contains sugar, Fruit Fresh should be used in a 1 to 2 ratio. 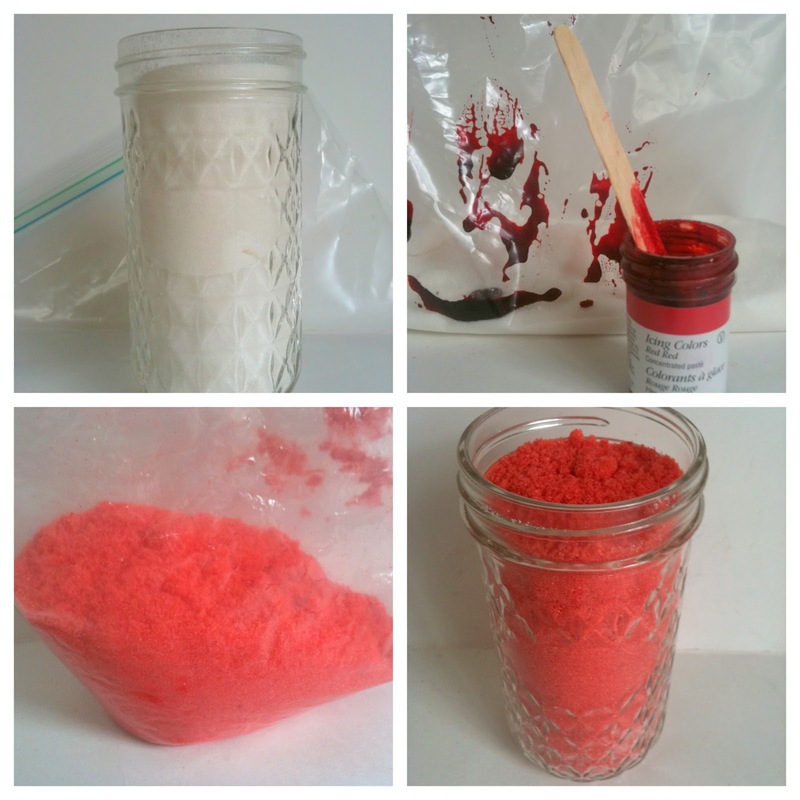 Put sugar and sour granules in a Ziploc bag and follow the same instructions for the cocktail sugar above, substituting pink gel food color for the red. The pink lemonade sugar makes a great hostess gift for summer BBQs too! Just garnish with some kitchy cocktail stirrers and you’re ready to go! to drop by and say hello at Rook No. 17. Amy, wishing you and your family the warmest of congratulations on your new addition! Thank you so much, Jenn, for stopping by to share your recipes with us! I cannot wait to try out the poinsettia sugar! Amy, thank you so much for having me here today! I think that pink lemonade sugar would be a great year round treat. It sounds like it would be great with summer cocktails! Such a clever idea for a hostess gift. I love Jenn’s ideas!